Full disclosure: I’ve never had a single bite of beef jerkey, or any kind of jerkey for that matter. I’m so clueless on the subject that I’m now finding myself surprised that spellcheck is telling me it’s actually spelled “jerky”. Nothing about tough-as-leather, over-salted, vacuum-sealed animal flesh formed into a skinny cylinder (Jerky Loving Editor’s Note: that’s actually a Slim Jim, Mara) and displayed on a gas station counter next to cigarette lighters has ever really appealed to me. Then, I met Malaysian beef jerky -- in a sandwich no less, a specialty of Pasar Malam, a new Brooklyn restaurant that also literally wraps its burgers in eggs. I wasn’t eating a beef jerky sandwich by choice, of course. Part of this job is eating whatever they put in front of you unless you can claim some type of allergy. 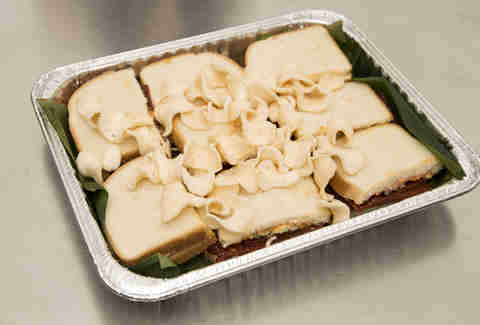 Anyway, when we pulled the cover off the tray, the sandwiches looked very unassuming: white bread, resting on banana leaves and topped with shrimp chips, which kind of look like packing material. I frankly didn’t see how the hell this would work. Jerky is something you have to tear apart with your hands and teeth like a caveman, or "paleo man" as fitness magazines call him. 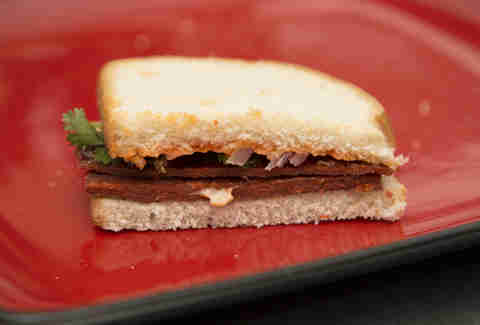 How could you not destroy the integrity of the sandwich with your first attempted bite, ripping all the jerky out in one go? Upon closer examination, though, this was not like the jerky I'd seen (in passing) so many times before. It was square, thin, moved like it had some moisture left in it, with slightly burnt edges letting you know it was fresh and hadn’t been drying for months under some UV light or in the sun. It almost looked like a burnt fruit roll-up. 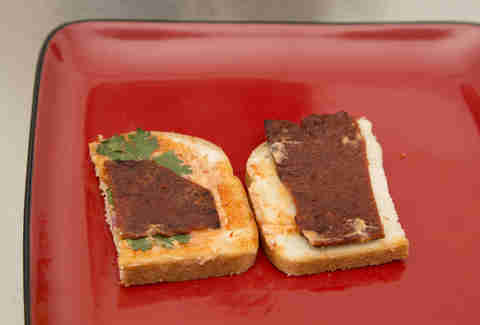 Each half-sandwich had 2-3 squares of jerky, and the bread was spread with mayo and sambal with a sprig of cilantro. Sweet and spicy. It reminded me of the crispy parts of Chinese spare ribs, except I didn’t feel the need to floss afterward. The jerky wasn’t tough at all. I didn’t have to tear it with my teeth. I wanted more jerky in between the bread, but didn’t want to be ‘that guy’ stealing meat from the other sandwiches in the tray (this office is apparently full of Unofficial Taste Testers). It was so easy to eat. I can totally see Malaysian mothers packing this for their kids’ school lunches. GO GET A BEEF JERKY SANDWICH (if you’re not near Brooklyn, which is entirely possible, order the essentially-the-same Singaporean version of the jerky here). You don’t have to be a world traveler or even an adventurous eater to enjoy these things. Unlike the desperate trailer park in the middle of a desert I once assumed would be the only place you could ever possibly find a beef jerky sandwich, they’re very approachable. 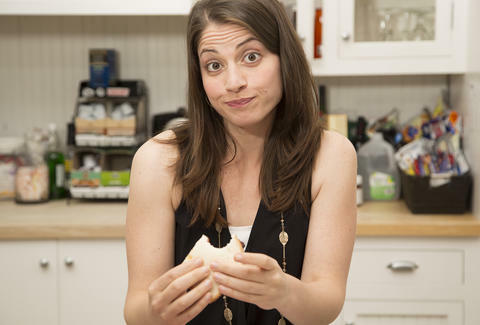 Follow our Official Taste Tester on Twitter, because SnapChat would just be weird.